The aesthetics of your home depends on a lot of things like how the paver driveway is laid out or how the pool decks and walkways are constructed and such. PaverCrafters Inc. has been incorporating art with housing for around 20 years along Florida’s West Coast. If you have a pool at home or want to build one, it has great potential of turning your home into a specimen of artful architecture. We construct raised pool decks using wood panels or pavers or concrete, which will soon become the envy of the neighborhood. The pool decks can become the center of attraction of summer parties. If you have a large garden at home, building a winding, paver driveway and walkway would add an artistic touch to your house. For commercial properties, geometric shapes are more appreciated, so sharply angled walkways made of natural stone are suitable. Using paving stones, our architect and engineering teams create a tapestry on the projects. Simplistic, minimalist designs that suit commercial properties are built using concrete pavers or brick pavers for durability. Interlock pavers are also used with tamped down sand, instead of thick layers of grout, in between them to provide a seamless facade. 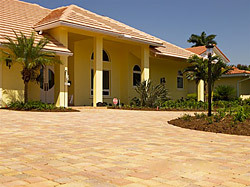 We source our pavers from the best manufacturers of pavers in Florida. Sometimes gardens become unmanageable due to undulations in the land. To restrain unwanted slopes of land, we build retaining walls that look like an inherent part of your landscaped garden. The Belgard retaining wall collection featuring Highland stone collection, Highland freestanding collection, Celtik curb collection and Diamond pro stone cut collection, use state of the art techniques with classic architectural style. We have installed these grand retaining walls in several gardens. Coupled with natural stone sculptures, your garden can transform into one belonging to a palace. If you want avant-garde style to complement your modernist house, we can install interlocking pavers tamped down on sand instead of being embedded in grout. At PaverCrafters Inc., we don’t build houses, we build dreams. The home you dreamt of is our end goal. Our customer care professionals, designers and engineers interact with clients every step of the way to ensure that every minute detail is to their satisfaction. From the start of construction to maintenance, we will be with you. Be it commercial hardscaping or residential, your dream project is safe in our hands. PaverCrafters Inc. is a trusted company which has put smiles on so many customers’ face. You can visit our sprawling 5000 sq. ft. showroom to see samples of variety of products and services we offer. We have been certified by Interlocking Concrete Pavement as installers and also have accreditation from Better Business Bureau. We offer hardscaping services in St. Petersburg, Clearwater and Tampa. So, if you want to get a quote on a project you have been planning or need expert advice, feel free to call us at (866) 573-7883.